Do not miss this book. If you are in charge of purchasing for your school or library, Every Falling Star is a must. SUMMARY: The son of a prominent military officer, Sungju Lee has plenty of food to eat, loving parents, and a nice bed to sleep in. 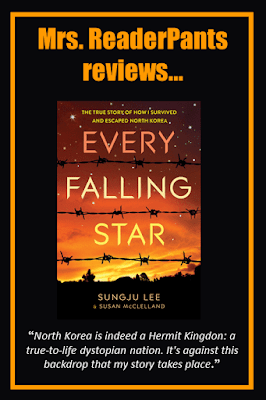 But when Sungju's father falls out of favor with the North Korean government, his family is booted from the capital city of Pyongyang. They move to a much poorer area, Gyeong-Seong, where Sungju attends school and his parents try to find work. On their own without government benefits, first Sungju's father, then his mother, leave to find food and do not return. At age 12, Sungju finds himself alone and homeless, and he forms a gang of other homeless boys in order to survive. REVIEW: Just this week, the US banned all American travel to North Korea due to safety concerns for American citizens. This decision came after 22-year old American college student Otto Warmbier died last month after being released from a 17-month stint in a North Korean hard labor prison. His crime? He allegedly stole a propaganda poster from a wall in his hotel. Stories like Otto's are difficult for most of the world to comprehend. What did this healthy young man endure to cause him to suffer significant brain damage and eventual death? As difficult as it is for adults to understand this situation, it's even more difficult for teens to comprehend a place where simply removing a poster from a wall will get you serious prison time and, at least in Otto's case, eventual death. There aren't many news stories coming out of North Korea these days, and books for teens about North Korea are sparse and totally needed. Today's teens hear about North Korea on the news, but they likely do not understand what's actually happening to citizens there or the history behind it. Most adults, including myself, have little to go on as well, relying on world news outlets to help us make sense of the situation in North Korea. So when I saw this book, I knew I'd be reading it. I have to start by saying that I read this on audiobook, and as much as I wish I could read by audio all the time, the fact is that I tend to drift off or focus on something else while listening to audiobooks. It's like if I don't just sit in a chair and actively listen, only about 1/3 of the content really sinks in. My confession here is that, though I've attempted many audiobooks over the years, this is actually only the second one I've ever completed (the other was Don't You Dare Read This Mrs. Dunphrey, maybe 15 years ago). I definitely think I would have connected with the story better if I had read the print book, I also think it says much about this audiobook that I was able to complete it (and could not complete so many others). I'm sure I don't have to tell you that Sungju's story is both true and remarkable. That he managed to survive life on the streets and keep himself and his "brothers" (his gang) safe is an incredible accomplishment. His harrowing escape from North Korea was my favorite part of the story; I was on pins-and-needles during those chapters near the end. The audiobook quality is good, but again, I don't have many other audiobooks to compare it to. I like how the author changed his voice for different characters; it was easy for me to tell who was speaking. Though the author has an American accent, he pronounces the Korean names and places confidently. THE BOTTOM LINE: Every library need this book. Adults should read it, too. STATUS IN MY LIBRARY: On order. Language: I do not remember any profanity. If it was there, I didn't notice it. Drugs/Alcohol: medium-high; It's easy to forget that Sungju and his brothers are only 12-14 and drinking sul (Korean alcohol) and vodka; they also smoke cigarettes.